1. Put the following alphabets in the correct order starting with the one with the least number of letters. 3. Since 1968, which country has had the most athletes tested positive for doping at the summer olympics ? 4. The hornpipe and the lanzers are the national dances in England. What is the national dance in each of the following countries ? 5. What was the name of the Dame du Lac or the lady of the lake, the fay who tossed Lancelot into the lake ? 6.The name for which red flower, also known as 'love lies bleeding', stems from the Greek word meaning 'everlasting' or 'one that does not wither' ? 8. The following are main characters in which book or film ? 9. A chemical element (Sb) meaning bad for monks. 6. 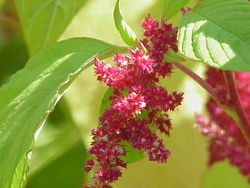 Amaranth Amaranthus, collectively known as amaranth or pigweed, is a cosmopolitan genus of herbs. Approximately 60 species are presently recognized, with inflorescences and foliage ranging from purple and red to gold. Members of this genus share many characteristics and uses with members of the closely related genus Celosia. Although several species are often considered weeds, people around the world value amaranths as leaf vegetables, cereals and ornamentals. The word comes from the Greek amarantos the "one that does not wither," or the never-fading (flower). 7. Agog The word stems from Middle English. From Old French, en gogues, in a merry mood. 9. Antimony Antimony in its elemental form is a silvery white, brittle, fusible, crystalline solid that exhibits poor electrical and heat conductivity properties and vaporizes at low temperatures. The ancient words for antimony mostly have, as their chief meaning, kohl, the sulfide of antimony. Pliny the Elder, however, distinguishes between male and female forms of antimony; his male form is probably the sulfide, the female form, which is superior, heavier, and less friable, is probably native metallic antimony. The medieval Latin form, from which the modern languages, and late Byzantine Greek, take their names, is antimonium. The origin of this is uncertain; all suggestions have some difficulty either of form or interpretation. The popular etymology, from anti-monachos or French antimoine, still has adherents; this would mean "monk-killer", and is explained by many early alchemists being monks, and antimony being poisonous.